When one evokes Denmark in Footballing terms, most people’s thoughts immediately turn to the early to mid 1980s when a West German Manager molded one of the most memorable teams in the history of the game. Into the 1970s, Sweden was the only Scandinavian Nation that would qualify for the Finals of a Major Tournament on a semi-regular basis. Denmark (much like neighboring Norway) still did not have a fully professional League. Periodically, a player would make enough of an impression that a Bundesliga club and/or a Dutch/Belgian club would take a gamble on. However, the emergence of one player would further the cause of most Danish players hoping to make it in the Western Professional leagues. Allan Simonsen would take the Bundesliga by storm and help Borussia Moenchengladabch win titles in domestic and European level. 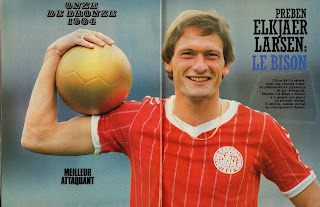 The continent would take notice and he would be rewarded with the Ballon d’Or in 1977. He was the rare exception of a Dane, who was viewed to be able to hold his own (and even surpass) with the best of the continent. He was the equivalent of a George Best or George Weah, a superstar who had the misfortune to be representing a Nation that could not qualify for the Finals of a Major Tournament. While Simonsen was shining on the field, a more significant event took place off the field for Denmark. 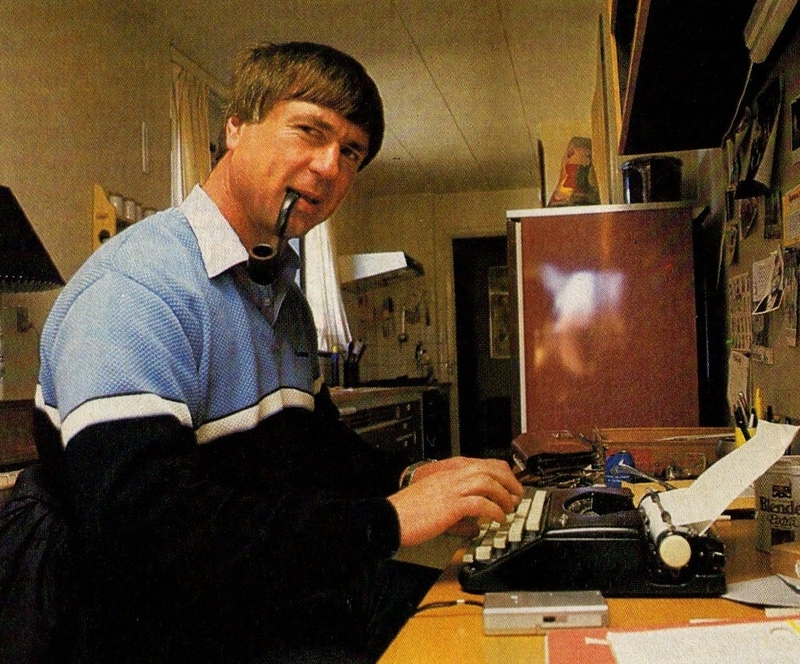 In the summer of 1979, former West German defender Josef ‘Sepp’ Piontek was appointed as the new Manager of the Danish National Team. He instilled discipline into the squad and demanded a more professional approach from his players. He displayed his authority by dropping the seemingly untouchable goalkeeper Birger Jensen of Club Brugge for missing an International match. In time, he would also learn to ease up and adjust his methods to take into consideration the Danish players’ mentality. He had been appointed well into the 1980 Euro qualifiers and could make no impact in a group that was eventually won by England. 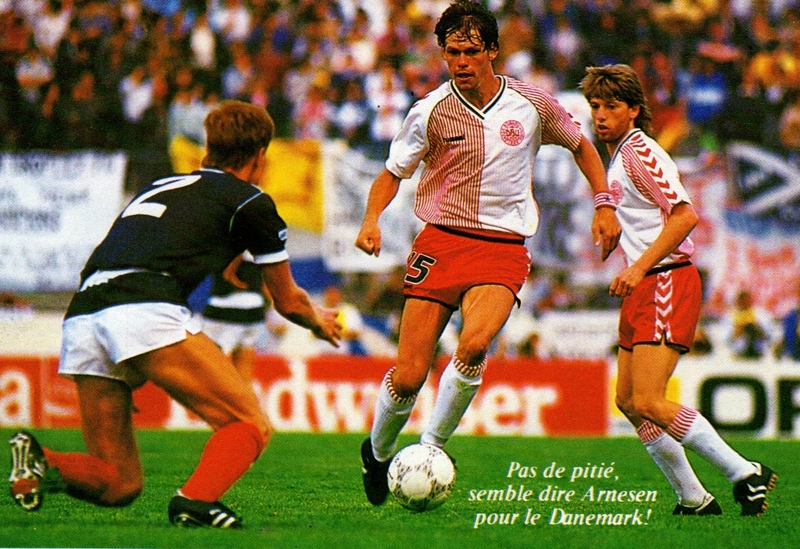 The 1982 World Cup qualifiers were the first qualifiers that Denmark embarked on with Piontek. His team already included a backbone of players that would serve him for the years to come. 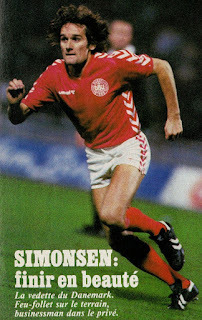 In addition to Simonsen (now at Barcelona), Søren Busk, Jens Jørn Bertelsen, Klaus Berggreen, Morten Olsen, Søren Lerby, Frank Arnesen, and Preben Elkjaer-Larsen were already integral parts of the group and for the most part had experience playing in the Western Leagues. They were drawn in a qualifying with Italy, Yugoslavia, Greece and Luxembourg. They started poorly and all hopes of qualification were lost as early as the Fall of 1980, when they lost their first three matches to Yugoslavia, Italy and Greece (at home). All that remained was to salvage some pride and built up a team for the future in 1981. The first notice that they showed that they were a team in the making was when they faced Italy at Copenhagen on June 3, 1981. They outplayed and defeated the future World Cup Champions (3-1). Impressive victories in the month of June at Copenhagen would be the hallmark of this squad. It was during the 1984 Euro qualifiers that this generation would come of age and really make its mark. In a group that contained two recent World Cup participants England and Hungary (but also Greece and Luxembourg again), they were not favored. The English, now managed by Bobby Robson, headed to Copenhagen for the first qualifier on September 22, 1982. 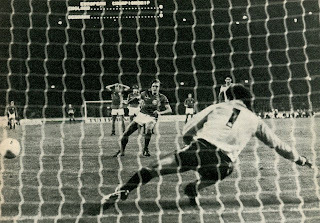 They English led twice through Trevor Francis, but Denmark fought back each time and snatched an equalizer in the last minute. While, for the English, an away point seemed like a good result, the Danes had impressed and gained confidence. For some time, into the Spring, English seemed set to qualify but Denmark kept pace by picking up wins vs. Greece and Luxembourg. On June 1st, 1983, they defeated Hungary (3-1) at Copenhagen to set themselves up as England’s main rival for the group. The rise of Danish football was further evidenced with two important transfers during that summer of 1983. 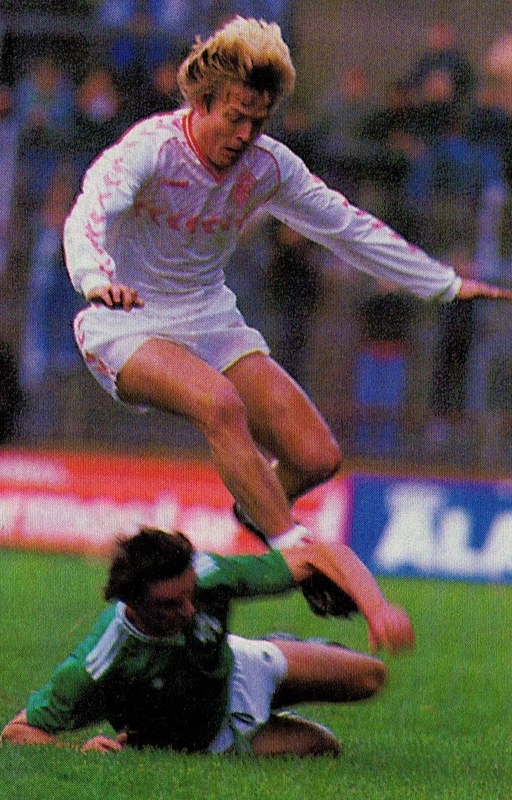 Søren Lerby joined West German powerhouse Bayern Munich (from Ajax) to act as the midfield General as a replacement for the retiring Paul Breitner. In addition, the talented teenager Michael Laudrup joined Juventus (after turning down Liverpool), though he would be loaned to Lazio for two seasons. Michael Laudrup underlined his rising star status by scoring twice in a friendly vs. France on September 7th, 1983 (3-1 win). The stage was set for the key match in the Group between Denmark and England at Wembley on September 21st. The Danes took the option on the Group by inflicting a rare defeat on England at Wembley with an Allan Simonsen penalty kick. Many observers view this match as the Reference point when this Generation was born. They suffered a minor hiccup, the following month after losing to Hungary at Budapest. After the win at Wembley, their destiny was always in their hands and they qualified for the Finals after defeating Greece in Athens in November. The Qualification had given rise to a sense of euphoria, as well as, praise from other Nations due to the positive and exciting brand of Football. However, the Danes did not possess a deep reservoir of talent. This handicap was exemplified in their (0-6) defeat vs. Holland in a friendly in March 1984. The Danish were missing many first team regulars and it was clear that they could not afford to lose many key players, as they could not call upon adequate replacements from the local Danish league. This friendly was a major wake-up call; nevertheless Piontek was confident in his team’s chances with everyone being fit and available. In the lead up to the Euros, the Danes suffered further defeats vs. Spain and Czechoslovakia, but Piontek still maintained confidence in his squad. In the Euros, they were to play vs. hosts France in the Tournament curtain raiser in Paris. In a hard fought match that they narrowly lost (0-1), Denmark showed it could compete and hold its own with the Competition’s favorites. Unfortunately, Allan Simonsen was severely injured in the match in a collision. This injury blighted the rest of his career and he was no longer as effective as before (not to mention ageing). Denmark picked up the pieces and destroyed Yugoslavia (5-0) in their next match and dazzled the Global audience with their now customary attacking style of Football. The third match in the Group was vs. Belgium, whom they had to defeat to advance. Denmark fell behind (0-2), but stormed back to win (3-2) with Preben Elkjaer scoring the winner near the end. The Semifinal vs. Spain ended in disappointment as Denmark lost in penalty kick shoot-out with Elkjaer missing his decisive kick. Spain would turn out to be Denmark’s bogey team for the years to come. Despite the loss, Denmark had been one of the revelations of the Tournament. 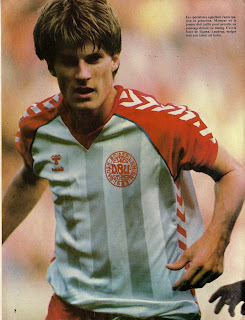 Players like Lerby, Arnesen, Morten Oslen, Elkjaer, Berggreen and Laudrup were now household names. Elkajer’s displays earned him a transfer to Italy’s Serie A and he joined Verona. They had also left a positive impression with their fans nicknamed ‘Roligans’, who always cheered their team on and were well behaved and never caused any trouble. Denmark went into the 1986 World Cup qualifiers with confidence as one of Europe’s finest teams, in a Group with USSR, Switzerland, Republic of Ireland and Norway. They never seemed in danger and won the Group by scoring 17 goals in the process. The highlight of the Group was their win over the Soviet Union (4-2) at Copenhagen on June 5, 1985, that has been described as one of the finest matches in the History of the Game. In a game where both sides attacked from start to the end, Laudrup and Elkjaer each scored twice. They entered their first ever World Cup as one of the Tournament favorites. They once again dazzled the World audience in the first round, in the Group of Death with West Germany, Uruguay and Scotland. After defeating the Scots (1-0), they simply destroyed Uruguay (6-1) with an anthology goal from Laudrup. They defeated their German rivals in the third match (2-0), where Allan Simonsen played his only World Cup match after coming on as a substitute. In the knockout round, they faced Spain of Emilio Butragueno. The Danes went ahead from a Jesper Olsen penalty kick, however, the same player was guilty of an erroneous pass that allowed Butragueno to equalize. After that the Danish squad, uncharacteristically, capitulated and Spain defeated Denmark with a heavy score of (1-5, four goals by Butragueno). Despite this defeat, they had left enough of a good impression in the first round, to be praised overall. In some ways, perhaps this was the moment that Piontek’s great side started to decline (but more about that later). 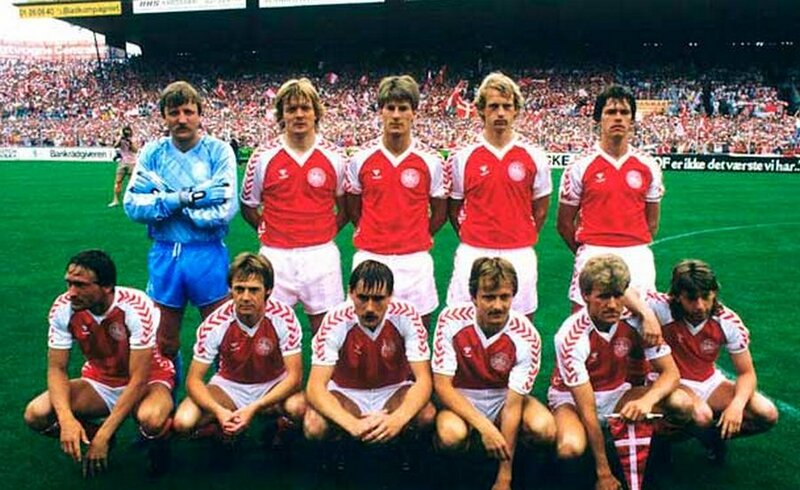 With a more or less intact squad, the Danes entered the 1988 Euro qualifiers in a seemingly easy Group with Wales, Czechoslovakia and Finland. Denmark naturally won this Group and qualified to the Finals in West Germany. Yet, there was a feeling that something was missing. Large and exciting wins were replaced with (1-0) wins and ties. The emergence of talent such as Peter Schmeichel, Flemming Povlsen, John Jensen, Jan Heintze and Lars Olsen was welcoming; however, regulars such as Morten Olsen, Lerby, Arnesen and Elkjaer were showing signs of age. Denmark entered the 1988 Euros and lost all its three matches vs. Spain (again! ), West Germany and Italy. Their displays were unimpressive and even Piontek at the time hinted that an era had ended. Following the Euros, some of the old guard stepped aside (Jesper Olsen, Morten Olsen, Lerby, Busk, Ivan Nielsen and Elkjaer). Piontek persevered with the national team to guide them through the 1990 World Cup qualifiers in a Group with Romania, Bulgaria and Greece. Michael Laudrup’s younger brother Brian was now part of the National Team setup. Others such as Lars Olsen, Schmeichel, Jensen and Vilfort now had leading positions guided by veterans such as Michael Laudrup and John Sivebaek. 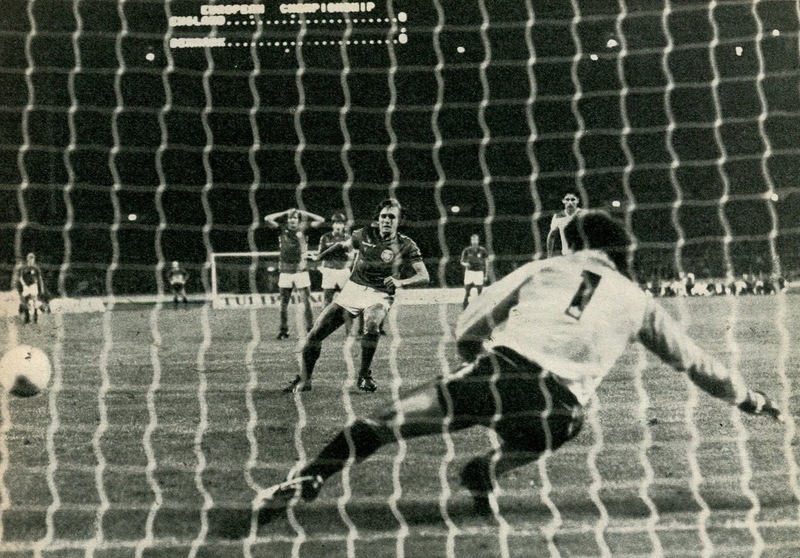 Denmark, still in a rebuilding phase, stuttered early on in the qualifiers and managed (1-1) ties in its first two matches in the Fall of 1988 vs. Greece and Bulgaria (at home). Things started looking brighter in the Spring of 1989, an away win at Bulgaria (2-0) was followed by a (7-1) win vs. Greece at Copenhagen. In June 1989, for a Triangular Tournament in celebrations of the Anniversary of the Danish Federation, heavy defeats were inflicted on Sweden (6-0) and an under strength Brazil (4-0). For an instant it seemed like ‘Danish Dynamite’ was back on track. When they defeated Romania (3-0) in October, they even looked odds on favorites to qualify for the World Cup. However, their limitations were exposed in the return match in November vs. Romania at Bucharest (1-3). Romania clinched the Group and qualified for the World Cup. Denmark had failed to qualify for the Finals of a Tournament after three straight qualifications. The Press declared this as the loss that ended an era begun at Wembley in September 1983. But perhaps the goal glut of 1989 was just a mirage. They had defeated a weakened Greece and a B-C level Brazil team on tour. With a closer look, it was clear that ever since the loss vs. Spain in Mexico in 1986, they had been stagnating and declining. After initially appearing that he might stay on, Piontek bowed out after the Press criticized his contract and salary. He became the Manager of the Turkish National Team in the new year (1990). In over a decade in charge, Sepp Piontek had molded one of the best sides in Europe. There are teams that owe their immortality through the number of titles won. Then there are teams that despite not winning trophies stay in our memories for the sheer joy that they gave the Audience. Denmark of the 1980s is in this category along with the likes of the 1954 Hungarians, the Dutch of the 1970s and Brazil of 1982. Richard Möller-Nielsen, Piontek’s successor, actually did clinch a title (the 1992 Euros). But chances are that it is the 1980s squad that the public actually remembers to this day.